The socks are missing as we learn that Dustin worked his way from a volunteer to assistant brewer. The socks were thermal and they are gone. We discuss the delicious Smokeshow which is a smoked dark mild made with Maris Otter, Crisp Pale Chocolate, and Weyerman Beach Smoked Malt. It is a 4% mild that is very well balanced. The smoky character really makes the mild style shine. Jason notes that this beer is a sessionable smoke beer which he finds uncommon. Andrew describes the beer as quaffable. Mashcraft has 3 locations. A 15 barrel system in Greenwood. A sour production with two 7.5 barrel tanks on Delaware street, and a 5 barrel brew house in Fishers. The wort for the Delaware Street location is brewed at Fishers and then fermented in the tanks at Delaware St. Andrew talks about the logistics issues of owning three small breweries. Dustin has taken over the wort production in Greenwood and Andrew is managing the pilot batches in Fishers and the fermentation at Delaware Street. Mashcraft primarily fills their own taps, but when sales are high, like in December, they will source some local beer and have some guest taps. Andrew brings up the age old question of whether it is better to sell low gravity beer cheaply or high gravity beer more expensively. There are possibly some spreadsheet toting folks that know the answer, but Mashcraft shoots for consistently great variety. They want to make sure that no matter who walks through the door, they have something they can enjoy. We asked the brewers what their favorite beers have been through time. Dustin started with the light lagers. His palate has changed to include IPA’s and Stouts and he is currently trying to embrace the sour beers that Andrew has fermenting on Delaware St. Andrew started drinking craft beer in the early 2000’s. His girlfriend, now wife, was drinking Sierra Nevada Pale Ale while he was drinking cheap beer. He then got a job at Oaken Barrel as a server. He primarily drank wheat beers. His palate has grown tremendously as well. His current preferences are for light, dry and acidic. Jason shows some love for the Raspberry Wheat from Oaken Barrel. Andrew goes to their Gnaw Bone Pale Ale. We discussed the variety of base malts that Mashcraft uses. They use an Irish malt for all of their lighter, hoppy beers. They have a sweeter Irish malt for their big beers. They will also add in different base malts for effect depending on the style. Some brewers stick to one base malt for inventory ease, but Mashcraft is driven by the product quality. For example they used a floor malted Bohemian pilsner malt to make a festbier. It was such a good result, that they will use this malt for some of their single malt beers. We take a break from our guests to discuss our personal problems, namely, Jason is ashamed to drink beer that I don’t like around me – which is silly. We then discussed this type of peer pressure in the tap room and asked how they manage this culture gap in their tap room. Andrew suggested that you can’t manage it, but you can brew for it. Their gold and their amber, for example are built for light lager drinkers, but their lineup certainly has beer for more traditional craft drinkers. Newcastle brown tastes like popcorn butter taste on purpose, but Aaron didn’t know this Aaron then fails to remember how to keep diacetyl levels in check. Basically he makes up science in lieu of remembering an article he read. We asked about the non-glam of owning a brewery. Andrew suggested its all non-glam. The glam is very small and the to do list is never ending. His job is basically finding good stopping points that he can sleep during. The non glam includes things like servers telling you that line 7 isn’t pouring correctly knowing that you can’t fix it. We then did discuss the glamorous feeling of adding hops and watching the airlocks start to crank on first fermentation. One of the best moments for Andrew occurs during the lagering process. When he looks down and sees the fermentor at 51 degrees and good action from healthy yeast – he knows it is going to be exciting to drink in about 5-6 weeks. He compares owning a brewery to being an artist, a publican, and a manufacturer. After all of the non-glam talk, we ask why they chose to open two more breweries in spite of all the difficulties. Andrew talked about how he has been lucky to surround himself with amazing people who are committed to the mission of great beer. His passion for brewing beer shows through in his commitment to all three locations. We learn that a Rock Bottom lease discrepancy begins the story of the Mashcraft brewhouse. They got a great deal on the system. They planned on Delaware St. right away to keep the over the bar sales in house and avoid the costs of distribution. Fishers was more of an accident, but a brewery was looking to sell their assets and it was to good of a deal to pass up. Andrew believes in his program and his people so he is confident that the added locations will grow their brand as a great neighborhood bar. Also, brewers should always wear their own shirts! Mashcraft taps a new beer every Tuesday, tap a Fast Friday infusion every Friday, and a new pepper beer every month. This helps them address the drive for new experiences among their customers. They also do 4 different coffee beers on the last Sunday of every month. They are focused on making new beers in a wide range consistently. He talks about how the 2 sized brew houses allow them the flexibility to keep this variety. For example, he can do NE IPA’s on his 5 barrell system and sell through them before they clear up. We talk about Indiana brewery laws. In a lot of ways they are favorable for Indiana Brewers thanks to Broad Ripple Brew Pub. So, brewers can sell locally if they manufacture locally. However, there are some issues with collaborations as you can’t sell beer to go (growlers/crowlers) that you didn’t make. So one brewer on the collab will lose out on this ability. Andrew gets into the question asking and asks Dustin about his experience as an assistant brewer. He takes out a notebook to improve his employee relations. We learn that Mashcraft uses steam heat dodges the question. His favorite part of the job is brewing, but also enjoys heading to the taproom and meeting regulars. He likes their feedback and has even created a basil beer based on volunteer Gary’s feedback. We then play “They Said What” which is a new game where we read untappd reviews and the guests try to guess the beer. After some hints they guess the beer – dark star. Jason’s off the wall question features a time traveling fox with whom the guests are roommates. He doens’t like chores- but we do determine that his dad’s name is Gene, Richard, George or Edward. And then we posed the question – what does the fox say? 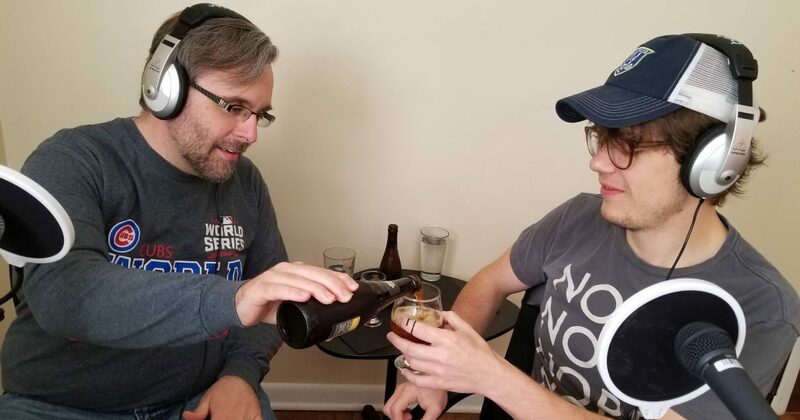 We come back for more of “They Said What” During this segment Jason continues his arm wrestling challenging ways – this time he he invites Andrew Luck and we determine that George Fountain Square is not the name of the owner of Fountain Square Brewing. Andrew correctly guesses Lift Off after two clues!!! Special guest chimes in about the Mashcraft lineup. He loves the variety and the ever present balance in the beers at Mashcraft. He often has the opportunity to share beer at events of with local and international guests. He is also responsible for the naming of one of the beers “roxy ninefingers”. Listen in for the story. We do Orval for the third run at “They Said What”. They struggle to guess it because of some bad reviews with inaccurate information and their lower level of enthusiasm for Belgian beers. We finish up the Podcast talking about a collaboration with Duke’s Indy – a Baltic Porter. A nice roasty beer with a lager yeast – this will be released soon!